There are not enough adjectives in the world to describe the brilliance of this novel. I was barely able to contain myself when I received the ARC in the mail – there was a lot of fangirling and I may have danced around my room a little. Just a little. 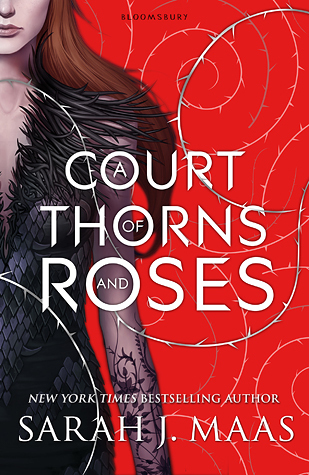 A Court of Thorns and Roses was my most anticipated book of the year, and I’m so happy to say that it did not disappoint. Far from it actually…it met my expectations and went beyond it ten-fold. ACOTAR is a retelling of Beauty and the Beast, but with fey. FEY. I’ve read stories about fairies before, but none of them can even compare to how amazing this book is. Sarah’s imagination is truly out of this world and her world-building never ceases to amaze me. We follow our protagonist, Feyre, on a journey that sees her leaving her family for a life beyond the wall that divides her people from the magical (and evil) fey. Having killed a sacred fey-wolf, Feyre is forced to forfeit her own life in return for the one she took…but little does she realise, her captor Tamlin has other things in store for her. The journey that Sarah takes the reader on through this book is beautiful. The world-building is magical, and as pieces of the story fall together, we experience a rollercoaster of emotions from hate to fear to love. And oh boy, do I love ALL THE CHARACTERS. Feyre is a total badass. She’s a survivor, having been the sole provider for her family before she went over the wall. She’s also smart and the inner Belle in her does shine through. I’m so, so, so glad to have met a character like Feyre, who loves her family enough to sacrifice her own life for them. And then there’s Tamlin. OH HOLY HELL TAMLIN, YOU ARE THE EPITOME OF PERFECTION IN A CHARACTER. Why can’t you be real? Tamlin definitely has his flaws, but deep down he is the most caring person alive. Everything he does is to protect his people, and you just can’t fault a guy that puts others’ lives before his. Can we all just take a moment to appreciate how perfect the romance is as well? This book is how ALL books in the new adult genre should be. There are definitely sizzling moments between Feyre and Tamlin, but Sarah has written it so well that it just felt right. There was a natural progression with their relationship and when the deed occurs (wink wink), it just felt like the right moment. New adult fantasy – I approve! ACOTAR moves at a fast pace and the action never ceases. There was not a single page that I found boring, which is a feat that’s really hard to achieve. Plus you all know how picky I am with books…heh. I am so, so, so very excited for you all to read this book. Sarah J. Maas can do no wrong, and I highly recommend that you buy a copy of ACOTAR as soon as you can. You won’t regret it, trust me.